Being the best option for the Luxury Coaches, Punja Sahib Transport Co. offers luxury as well as comfort in the best possible manner. The company is based in New Delhi and the Coaches on offer include Mazda, which is used by schools within NCR and the Semi Volvo Coaches with 18 seats or 35-37 seats. 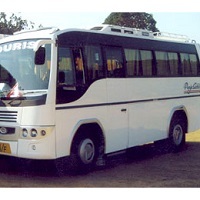 You can also contact us for a 40-seater Volvo with chemical toilets and we ensure timely reverts.